Wow! I haven’t been there. In my mind that is the most beautiful place on earth. Thank you for sharing. Take care. Thanks, Michael. I am looking forward to seeing your photos. Have a great day. I’m very impressed not only with the photo but also your climb in such terrain. What an achievement! Great mountainous terrain! I am glad you are having a well deserved break. Time will heal your loss. Rejoice in her life and not mourn her death. Celebrate the memories and your mum’s achievements. You are a product of her and she is very proud of you, I am sure as she looks down from heaven above to bless you and your loved ones. Garfield hugs Michael. Live life! Celebrate her life. Do not mourn her loss. This is how I see it and when the time comes for my parents to leave me, this is how I must do it, once we get past the loss and sadness. It is easier said that done and I recognize it. Take heart and have a good break my friend. I am glad that you write to me, talking to me like a close friend and giving me the advice and comfort. I thank you very much for this. I am trying to restart my life after this battle that I have been fighting with her for the last three years. Thanks so much again and hope that you are doing well. God bless. Again, sorry for the loss of your mother. It’s great seeing you and your wife take a nice break to get in tune with nature. God Bless. Hi Michael. I am so glad you stopped by. Due to computer issues I have lost quite a few of the blogs I followed and as I can, rejoin. I have missed your wonderful posts and now can once again enjoy your work. 🙂 Thank you! Hi Lea, I am starting to travel a bit more and putting more efforts into blogging after mom has passed away recently as I am now free of my duty as a carer. You are always welcome to peruse my posts. Hi Michael, please accept my condolences on your loss. There will be many who will look forward to sharing in your travels via your posts and I count myself among those fortunate ones. I have a dear friend visiting currently so it may be awhile before I can make even a small attempt at catching up on all the blogging posts I have missed but I shall also be armed with some of my own new photos from the journeys Rita and I are making before her return to California. Many thanks for your kind thoughts and words. I will look forward to viewing your new posts / photos. Kind regards to both you and Rita! Wow, Michael: So glad that you have finally made your trip to Huang Shan. And lucky you, you have seen the sea cloud. Your picture is very beautiful. Can you share more? I went to Huang Shan in 2005 after a big family trip back to my grandfather’s village. It was a very memorable trip. Hiking is not my interest but I made it with our big family group (40 people including cousins from everywhere) with lots of difficult hiking. My most recent adventure is hiking at Machu Picchu in Peru. Just came back two weeks ago. Comparing with Huang Shan, it is much more difficult! I have been very lazy in writing blogs. Will share some of my photos later. Hi Denise, I will post some more, better photos, showing the sea of clouds. I don’t want my readers to view the best at the start. Wow, you have visited Machu Picchu! I will contact you for advice when I plan to go there. I just wanted to do something which I can no longer do as I aged. Ha ha Michael, if I can do it, anyone can. I am very non athletic even when I was very young. You will see more of these pictures in my blog in due course. 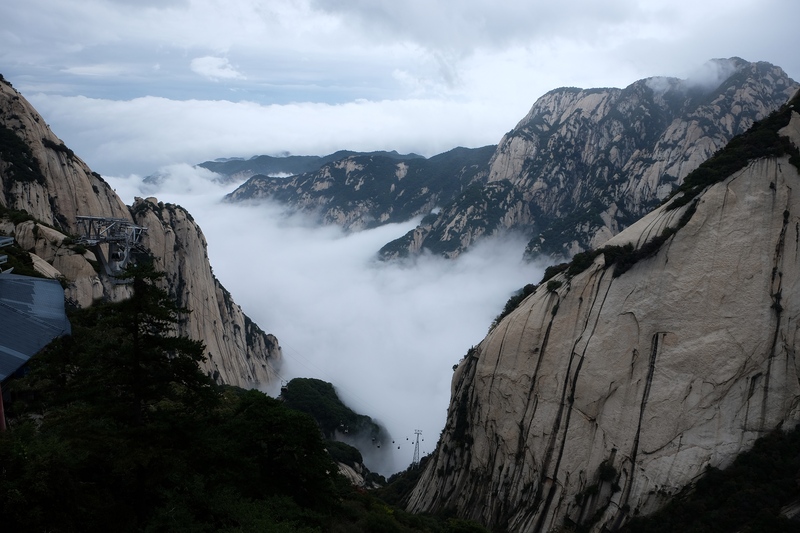 It is renowned to be the most difficult mountain to hike in China. Good. Looks like a nice trip. Need to get back in shape. Should start with something lighter . . . . for my wife, it is nothing! First trip away for you in a while. You will catch up. Wife is away for three weeks to look after her father in Sydney. He has a knee replacement operation yesterday. Will organize another trip when she is back. Yes, very well I was told yesterday. I agree that misty mountains may have spirits. On this trip to HuaShan, while going up the mountains, a golden moth stuck to my backpack for at least 30 minutes and refused to go away. My immediate thought was – it may be my deceased mom who may want to travel with me or at least to tell me that she was with me. Coming back, I Googled and found that moths are known in the Western and oriental cultures to represent spirits. Is this strange? I hope that was really mom trying to tell me she was / is with me. Many thanks, The Secret Keeper. PS I tried to click into your blog from WordPress a couple of times, it was directed to a Japanese blog. Do you know the reason? Try using the link: https://secretkeeper.net/ It works. I had to drop the ‘the’ a while ago due to Google condemning my blog for being dangerous. It wasn’t true but I couldn’t get them to listen so I changed my blog link & was able to keep all my content. The above link should do it. Weird you get a Japanese Blog. I will have to check that out. Someone bought my link & tried to sell it back to me. The Japanese blog may own it now. Hope to see you at the new Link. A couple of days ago, I clicked your link in WP under your message and got the Japanese blog twice. Think it’s now OK and I can peruse your good blog! Thank you Michael. I did check the Japanese blog. No idea what my old link has to do with their content. I will do my best to keep ‘the secret keeper’ continuously amusing . entertaining . informative . and enlightening. I love you share your journeys on your blog . otherwise I would not see the mystical and beautiful places you share. Bless you for your adventurous nature. Wow what an adventure you’re on. HuaShan mountains are absolutely stunning. It is the most difficult to climb mountain in China because of its steepness. Coming to think about it, it won’t be good for the knees!